What is your kegemaran song ? does any one know japanese here?? if so, can anda translate the video for us like nico nico atau the band komen-komen on their songs ?? atau please if anda find video subded share it with us !!! Ko-ki (born May 1st, 1990; Japan) is a Japanese artist member of the popular JRock band ViViD. He is the band's drummer, acid and DJ. 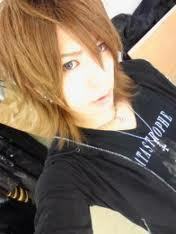 IV (イヴ) (born February 16th, 1990; Japan) is a Japanese artist member of the popular JRock band ViViD. He is the band's bassist and the composer of most of their songs. If Shin could switch roles with another band member for a hari he would play ?